Dear friends, grace and peace to you from God our Creator, from our Lord and Savior Jesus Christ. Amen. A man is sitting at the desk in his home office. It is in the late evening. He is sifting through and paying some of the household bills. Then a crash, and yelling and screams. The man recognizes the voices of his wife and kids. Hmmm… what are we going to say about this fellow? Well… there is something extraordinarily wrong with him, isn’t there. His reaction… is not normal. As commitments and values go, paying your bills is a good thing to do. paying the bills should drop down quite a bit on the ladder of priorities. should become secondary, at best. have been hearing the noise of records being broken in the house lately. The drought of 2012 broke records. Hurricane Sandy on the east coast… broke records. and broke some records of its own. Typhoon Bopha followed Sandy by a few days and broke records in the Philippines. Lake Michigan set an all-time low water mark in late January. and the noise of records being broken is getting rather loud, we’d have to say. Global Warming? / Stop Worrying. / Start Panicking! It may be exactly what we should be doing. It is that we have gained the power - through our own ingenuity - to threaten the very fabric of the world that makes human life possible. is the threat of nuclear war and annihilation. The Fate of the Earth. Jonathan Schell became our “elder statesman” on the subject through his sober reasoning. and all the persons whom you care about? The absurdity dawns upon you, when you realize that no human value would survive such a “defense”. We just observed the 50th anniversary of the Cuban missile crisis in October. When I say “we”, I mean “the world”. It was a kind of celebration because… we’re still here! I was 9 years old at the time. I can remember it a bit. without the unthinkable having happened. especially with the declassification of additional documents. we were even luckier than we’ve thought. to off ourselves from the planet in a number of creative ways. Will we be wise enough to survive our smarts? There is a worldwide community of scientists who focus on our climate and related issues. I want to say something about it. A debate has been going on within the scientific community. Recently it has become more intense and anxious. There is 98 percent agreement among the scientists on these matters. Can we avoid the collapse of global civilization – as a consequence of global warming and climate disruption? would be “incompatible” with industrial civilization as we know it. perhaps even by the year 2040.
based on our emissions record. That will be a world of dangerous climate disruptions. No one really needs a degree in science to understand this, really. Only a modicum of observation. had all occurred since 1997. If we will say then that the hottest 12 years on record have all occurred since 2012. Where will the southwest of our country be? is giving us more trouble than was anticipated. and to fudge their studies by using the most optimistic assumptions. The science community thinks that it is fairly certain that we will surpass 2 degrees. 2 degrees, say the physics, means that the Greenland ice cap will go. 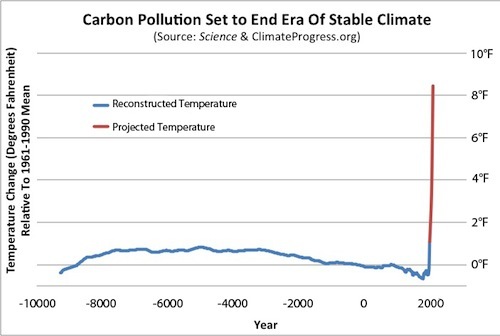 suggests that we will see 6 degrees of warming by the end of this century. That’s about 11 degrees Fahrenheit. Mammals cannot live in that world. Scientists say that at those temperatures mammalian sweat glands are not able to cool the body sufficiently to keep it going. Two distinguished members of the scientific community were talking recently. One is Dr. Paul Ehrlich, who is widely known and respected, and the author of dozens of books along with is fellow-scientist wife, Anne Ehrlich. Some of you may remember that his book The Population Bomb, which made quite a splash in 1968. This question came up…Will we avoid the collapse of civilization? That is just what two, albeit distinguished, scientists said… in a non-formal discussion. I’m sure that is to a great degree an intuitive call. Says, yes, he’s optimistic it is possible. And we can’t wait ten years to begin doing the things that we know need to be done. We have to start right now. I agree… that fear is often used when it shouldn’t be. Fear is often used by leaders to manipulate people. But it is certainly not true that fear doesn’t motivate people. That is why it is such a quick “turn to” for manipulators. And, if we think about it, that shaping is predominantly for the better. It can be for the worse. because it burns, and it hurts, and you are afraid of the pain that results. That fear is a gift. That fear is appropriate… and it preserves your health and your life. Without that kind of fear it’s impossible to imagine that human beings would have survived. becomes the opposite of helpful. Inappropriate denial… is itself a threat. I am not afraid that we will be afraid. But I am afraid that we will not… not existentially, not seriously… in time. Appropriate fear is a powerful motivator. locked her neck to equipment that is being used to construct the Keystone XL “Tar Sands” pipeline.. Her actions halted construction at that site… for a day. She cited her concerns for Oklahoma’s waterways. may harm those waterways, and damage the health of future generations. I consider her actions… a brave, and prophetic, and appropriate response… to her fears. Of course, it could be said that her fears… are the flip side of her loving concern. because he loved his people greatly. Love… and protective fear… go hand in hand. That man did not experience appropriate fear, did he? Therefore he did not spring into action to do what he could do to perhaps avoid catastrophe. Somehow, we’d have to conclude that he also lacked appropriate love. will respond, but not rapidly enough to forestall a clear march towards catastrophic warming. as the only hope to hang on to a “live-able” environment. No one knows what the outcome of that may be. The failure to be wise, not merely smart. And beyond that, I cannot go. We should all know it. It isn’t new, it is ancient. We have heard it time and time again… though perhaps we have not fully trusted to it. was accompanied with a command and a “shape”…. it was to be a caring dominion. The peace of God which passes all understanding keep your hearts and minds in Christ Jesus our Lord. Amen.